The Lower Modernisms – 018. 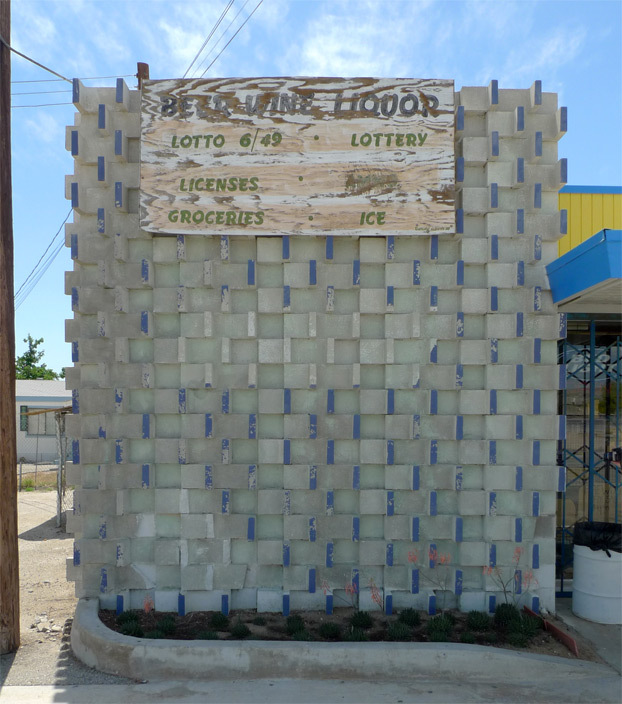 Lomo Featured Project: Skip’s Liquor and The Swamp Cooler, North Shore, California. June 12, 2011 by James Black. 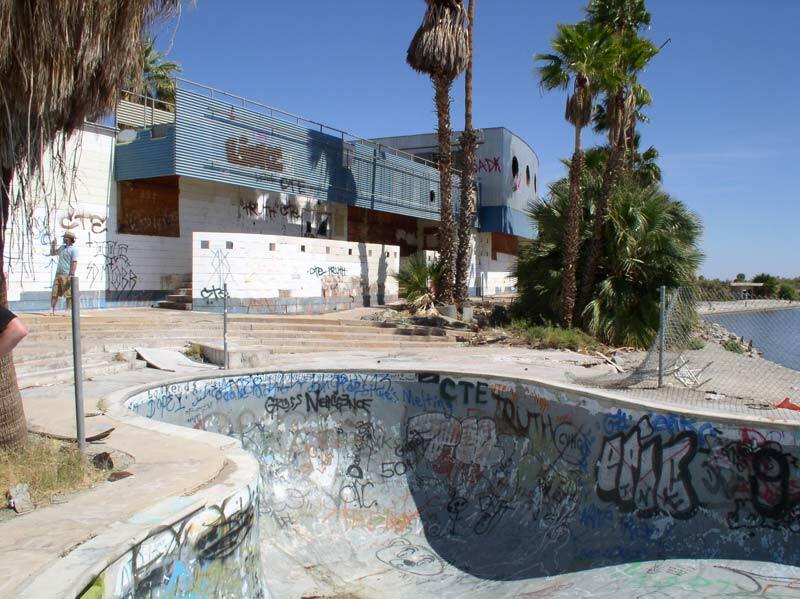 The townlet of North Shore, California, is best known as the home of the North Shore Yacht Club, Albert Frey’s 1962 Nautical-Modern building on the Salton Sea. Until last year a derelict and dangerous wreck, this building was quite nicely renovated and reopened in 2010 as the Salton Sea History Museum. Feeling a sense of nostalgia for the Yacht Club in its pre-renovated derelict days may seem tasteless and unseemly, but also quite natural. 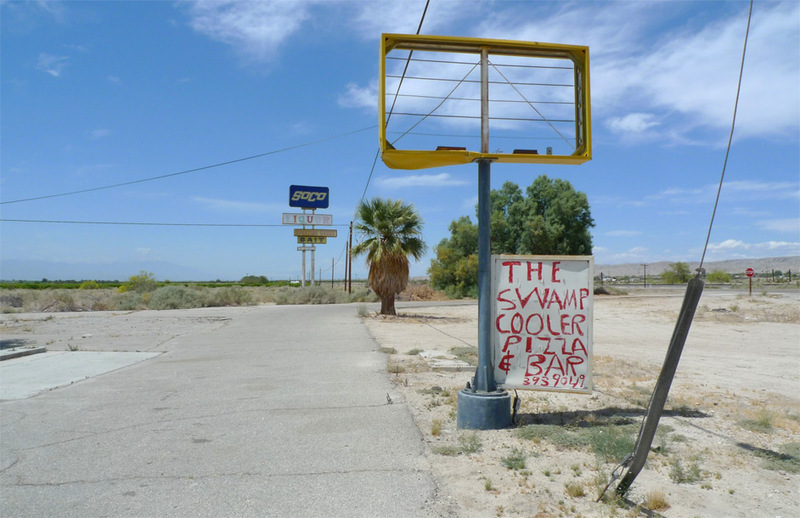 Right off California Highway 111 is an even older modern masterpiece, still in a state of untainted beauty – Skip’s Liquor and The Swamp Cooler, also known as the “Apocalypse Mart” for reasons that should be obvious. 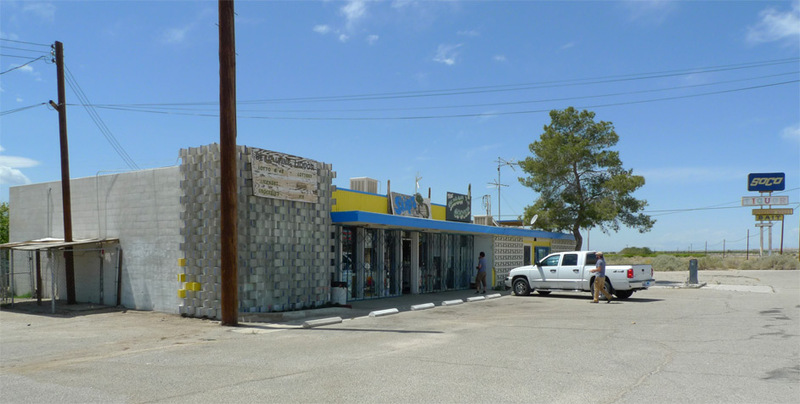 Owned by the same family since 1958, Skip’s has seen the mid-century vogue of the Salton Sea as a resort destination come and go, and still perseveres selling quality package goods and general store items to locals and visitors at reasonable prices. The Swamp Cooler, unfortunately, closed some time ago, although visitors will find that the liquor store is anyways cooled by swamp coolers. The handwritten sign remains clear and legible in the dry desert climate, although above it is a sign advertising only clear blue desert skies. 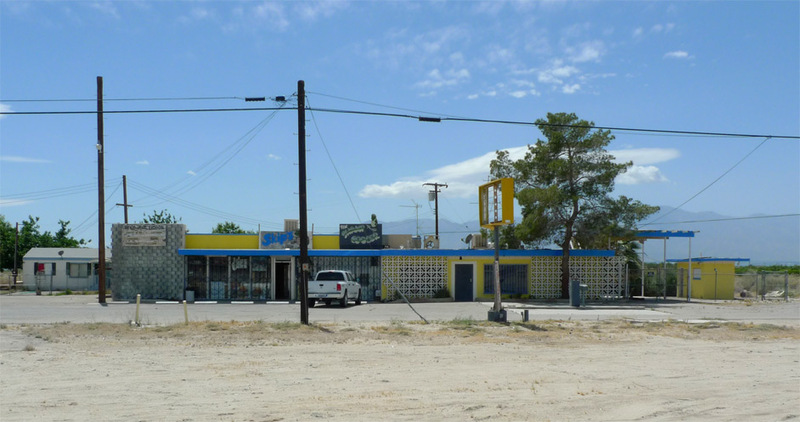 As of April 2011, I observed no evidence of any banana museum, but I will surely return in future years, as the circumnavigating-the-Salton-Sea road trip has become an annual reunion pilgrimage for us former residents of the Stucco Beast. A set of photos from this year’s road trip is hosted here on Flickr. The building is a composite of concrete masonry and wood post-and-beam construction, a popular choice in this environment where beausage (the beauty that comes from usage) is visible everywhere but the dry air maintains ruins in a state of decadent frozen beauty. 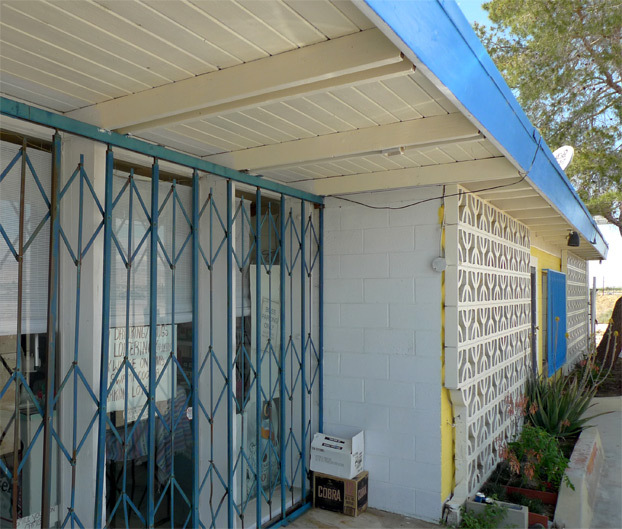 Asymmetrical in its composition, most of the front is defined by the strong horizontal line of a wood-framed flat overhang, filled in below alternatively by glazed storefront and decorative concrete screen blocks; the left side front employs textured blocks that express this corner of the building as a solid chunky mass, interrupting the horizontal span of the overhang. These textured blocks, among the most three-dimensionally rendered of any concrete masonry unit block known to mankind, give this mass a fuzzy, hirsute quality that softens the effect of its appearance (and credit for popularizing the term “hirsute” in architectural discourse must be given to UCLA architecture faculty Heather Roberge and Jason Payne). 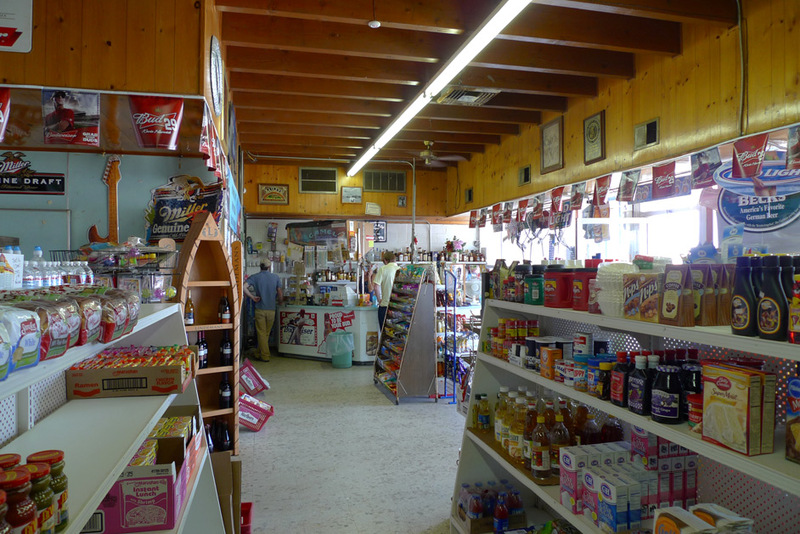 Skip’s is pleasant on the inside, with wood paneling installed around the whole interior above a constant datum established by the height of the glazed storefront. The wood plank and beam structure of the roof is exposed and is surprisingly high – looking at Skip’s from the exterior, you might expect that the vertical wall surface above the overhang is simply an extended parapet “false front,” but the roof is actually at the top. This extra height in the interior gives Skip’s an airy feel inside, and probably helps keep the space comfortable in the hot desert climate by encouraging stratification, with hot air able to rise into the volume above head level. In this view it is revealed that the screen blocks are purely a decorative element, installed in front of a conventional masonry block wall. The screen is of a relatively uncommon pattern, reading as circles on a diagonal grid, and from a distance has a vaguely Islamic style in the mode of Edward Durell Stone. Somehow they have managed to paint the wall yellow behind the screen block while keeping the screen blocks white. This wall section presents a fairly elegant way of creating a hollow soffit to enclose HVAC supply, and also thereby tying the backspan of the cantilevered beams of the projecting overhang to the roof framing to balance the cantilever.